Found 8 file extension associations related to PhotoPhilia and 2 file formats developed specifically for use with PhotoPhilia. PhotoPhilia is a dedicated image-management application that helps you organize images, video and audio clips into albums. 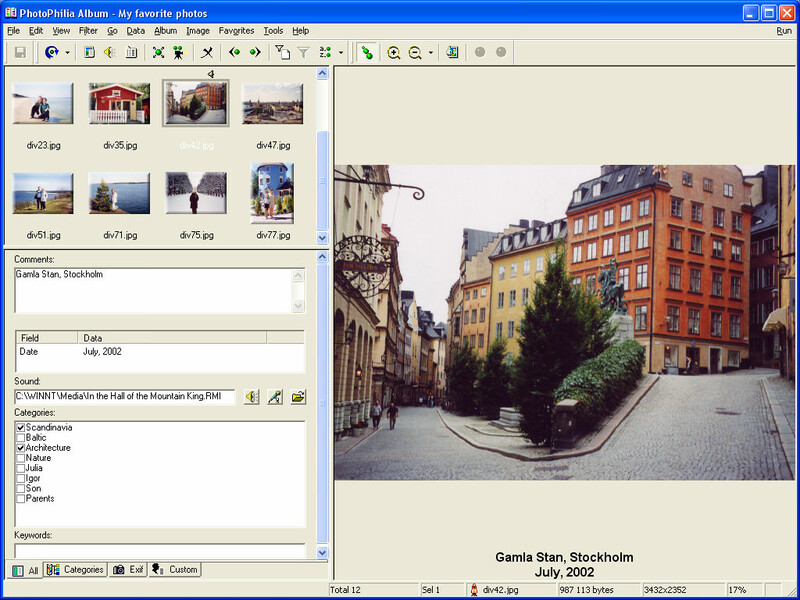 Using PhotoPhilia's explorer interface, you can browse through images on your hard drive, CD-ROM or digital camera. The program supports Canon CRW/CR2, Nikon NEF, Sony SRF, FUJIFILM RAF, and Minolta MRW file formats. Exif standard support: you can view Exif fields (as a list or customizable captions), search for Exif data, use Exif in the Batch Processor, auto-rotate images using Exif Orientation tag. In the album window, you can label each image, attach keywords, assign categories and add sound for inclusion in a slideshow. After you've added keywords, comments and categories, you can search easily for an image taken on a particular day or at a certain event. PhotoPhilia's powerful image editor lets you crop, auto-trim and resize your images. You can also rotate, flip and skew them; adjust their brightness, contrast, saturation, hue and gamma; plus apply a rich set of artistic effects, including posterising, blurring, embossing and solarising. PhotoPhilia enables you to create web galleries, contact sheets and slideshows from your pictures. Create and share slideshows that include captions and sound annotations for each slide, transitions, background music. Print your photos with a number of options including the ability to print several images on a single page. PhotoPhilia's batch scenario editor enables you to create custom batch operations to resize, colour correct and apply effects to an entire album of images or to the filtered ones. The program includes several build-in batch scenarios like Convert, Rename, Stamp, Frame, and others. PhotoPhilia can read, print, modify AWD files, and convert them to other formats. It also manages multipage AWD faxes. If you need more information please contact the developers of PhotoPhilia (Pholix Software), or check out their product website.